"The Walled City did have a strange status and a peculiar life of its own: it was not governed by law. As a result, it had become a haven for illegal immigrants, criminals and vice of every kind." 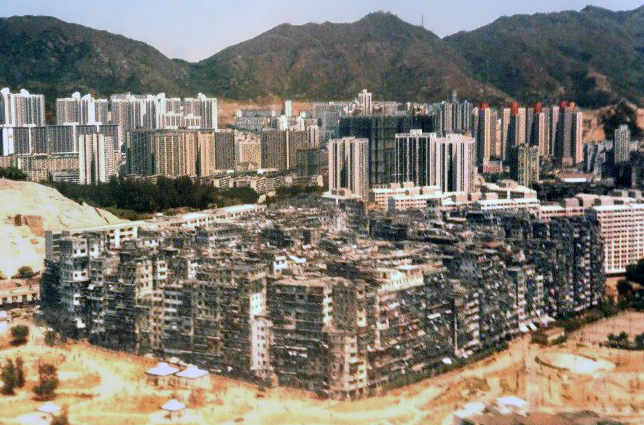 When one looks at the pictures of the Kowloon Walled City Park one can hardly imagine what was to be found in this very place less than two decades ago. Until the beginning of the 1990s some 40,000 residents lived within this 6.5-acre (0.026 km2) area, cramped in unhygienic, infested houses, built illegally by all sorts of people who, for whatever reason, chose to take refuge in that "city of darkness", as it was known in those days. Before being demolished in 1994, Kowloon Walled City was an enigmatic and appalling anomaly in this modern, wealthy metropolis. That compact mass of dilapidated, squalid houses stood in the middle of residential areas, like a mysterious, impenetrable fortress, governed by its own laws, dominated by criminal triads, inaccessible to outsiders. For almost a hundred years, this small enclave inside the British colony was claimed by both China and Britain, but de facto neither country exercised jurisdiction over it. 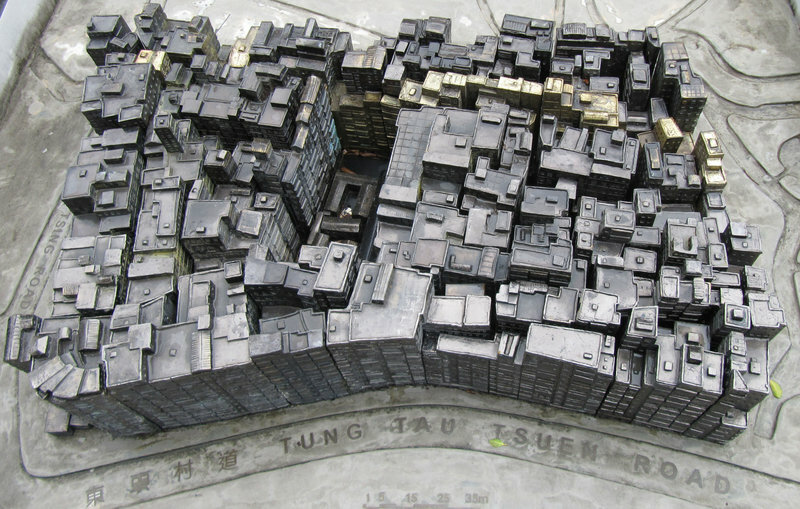 The origin of Kowloon Walled City dates back to 9 June 1898, when Britain and China signed the second Convention of Peking, with which China leased to Britain what was going to be known as the New Territories, an area of 370 square miles comprising the peninsula south of the Shenzhen River and 230 islands (Tsang 2011, pp. 38-39). Britain wanted China to cede the territories in perpetuity, as it had been the case with Hong Kong Island and a small fraction of Kowloon peninsula in the past; but the Chinese, trying to avoid the worst, resisted, and consented only to a 99-year-lease, which the British accepted. Furthermore, the Chinese demanded to retain the administration of their Kowloon military garrison. 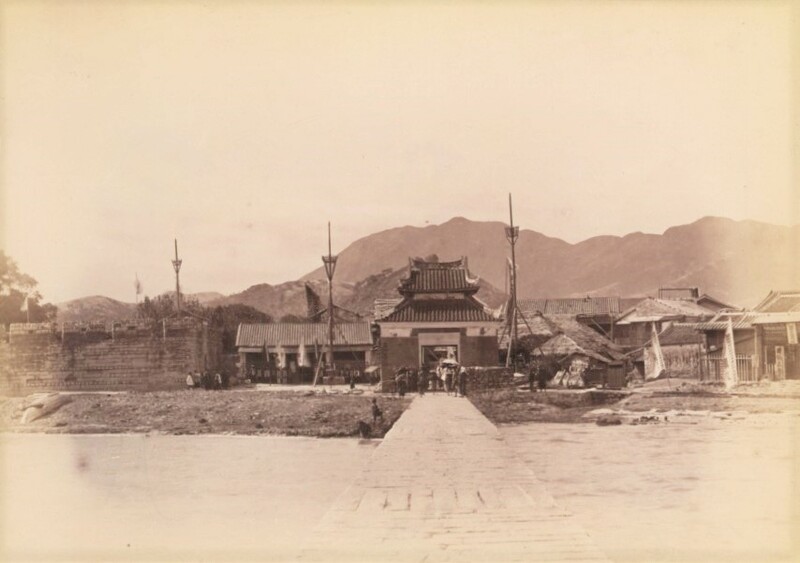 The Kowloon garrison had been built in 1846-47 to counterbalance the military presence of the British, who had taken possession of Hong Kong Island in 1843. The emperor himself ordered the construction of fifteen-feet-thick stone walls, watchtowers and heavy gates (Ingham 2007, p. 191). There were 744 people living in the fort, 544 of whom were military personnel. There was also a yamen, a magistrate's office (Tsang 2011, p. 40). The 1898 Convention said that "the Chinese officials now stationed there shall continue to exercise jurisdiction except so far as may be inconsistent with the military requirements for the defence of Hong Kong" (ibid.). The British first acquiesced to keep the Chinese military garrison in the very middle of their possession. But in 1899 they unilaterally expelled the Chinese and raised the Union Jack over the walls, and the Chinese military personnel abandoned the fortress. The Chinese state never accepted this breach of the Convention, and so, in order to avoid further controversies, the British colonial government refrained from administering it. For decades the Walled City was governed by no one, and over the years it became a lawless refuge for all sorts of people. In 1912, for example, a group of Manchu loyalists escaped from mainland China to the Walled City and continued to live according to the same old imperial traditions that the new Republican government had abolished after the 1911 Revolution (Wordie 2007, p. 226). In 1942 the Japanese demolished the walls that had been standing there ever since its construction. They used the material to extend the Kai Tak airport runway (Ingham 2007, p. 192). The airport, which was from 1925 to 1998 Hong Kong's main airport, was so close to the Walled City that planes flew above it, very close to the houses, all day long. After the Second World War the Walled City was occupied by an increasing number of illegal settlers. They began to build houses, mostly of between 9 and 10 storeys (Lung 1999, p 38). An old German documentary shows the life inside the Walled City. Tiny, dirty flats; no running water; electricity was illegally bugged from the surrounding buildings. The residents were not jobless. There were small factories, without windows, with old machines, where people worked 12 hours a day 7 days per week, producing extremely cheap goods that were sold to retailers in Hong Kong; even food, like noodles or fish, were processed in small factories, under terrible hygienic conditions - rats and cockroaches were common sight. The Walled City was an economic unit that gave its contribution of cheap labour to the economy of Hong Kong. It may be surprising to us today, but some people really wanted to live in the Walled City because of cheap housing and the absence of laws and taxes. A 58-year-old Chinese herbalist who was evicted at the beginning of the 1990s stated that he and his family lived in a 290-square-foot (around 27-square-meter) flat where he also had a medical practice and even performed operations on patients. Without a license. He was happy about his life, because, as he said, he could earn $2,000 per month, pay no taxes and little rent (The New York Times International 16/ 6 / 1992). The Walled City housed "small bakeries, butcher shops, clothing, toy and noodle manufacturers, and medical and dental clinics" (ibid.). Inside the Walled City, no one payed taxes, there was no police, and no safety and health regulations. Restaurants and factories operated in extreme high-risk conditions. Most families fetched water from common-use water pipes. Since there was no sewage system, people payed workers to collect the waste in their chamber pots every morning (ibid.). Because of the sovereignty dispute between China and Britain, the Walled City was "a haven for those on the fringes of colonial society - poor Chinese immigrant families seeking cheap housing, mainland doctors and dentists who set up practices with no licenses, drug dealers and thieves fleeing the Royal Hong Kong Police" (ibid.). Drug addiction and prostitution were among the major social problems in the Walled City. Already in 1952 community services were started, mostly by Christian organizations, like the clinic set up by Reverend Lau Chi-sham. Eventually he also established a kindergarten, a school with lunch provided for the children, a youth centre and an activities centre for elder people (source: Walled City Park plaque). The probably most famous social worker in the Walled City was Jackie Pullinger, a UK-born Christian missionary who came to Hong Kong in 1966. She helped many drug addicts, prostitutes and homeless people (there were also 'street sleepers' in the Walled City). "It did not take me long to discover", wrote Jackie Pullinger, "who really ran [the Walled City] - the Triads" (Pullinger 1989, p. 21). They demanded protection money, monopolized the drug traffic. "Taking opium or heroin was commonplace in the Walled City. Even though drugs potentially made a Triad member unreliable or useless as a fighter, many in the gangs were hooked. They were often dealing in drugs anyway and it was a short step to trying some for themselves [...]. Once the drug took hold, it was just a matter of time before the addict lived only for the next fix, reduced to stealing and violence, blackmail and immoral earnings from women" (ibid., p. 29). Prostitution, often involving underage girls, was another endemic problem in the Walled City. "It upset me to see twelve- or thirteen-year-old prostitutes and to learn that these girls were not free, having been sold by parents or boyfriends. It troubled me to meet their minders - the aged mama-sans who sat on orange boxes in the streets luring the Walled City voyeurs with promises of 'she's very good, very young, very cheap' " (ibid., p. 14). For decades the Walled City had been a thorn in the side of the British colonial administration. But because of the row with China, who saw the Walled City as part of her own territory, the British could not take action. Finally, after long negotiations, Deng Xiaoping agreed that it was in the best interest of both sides to tear it down - after all, Deng had already secured the handing back of Hong Kong to the mainland and the dispute over that small piece of land was not so vital any more. The British government began to relocate the residents of the Walled City, despite strong resistance on their part. In 1994, the Walled City was demolished and the site cleared to give way for a commemorative park. Soon after the debris were removed, the structure and some relics of the old Imperial fortress were discovered. Today's Walled City Park is a partial reconstruction of the old garrison, with several modern additions. Nothing remains of the infamous Walled City. It is hard to imagine that instead of this nice park once stood one of the most densely populated, unsafe and anomalous places in the world. In the 1980s the Walled City had reached the status of a myth. Today, it is forgotten. Visiting the park today is like visiting an ancient Greek or Roman archaeological site; you must use your imagination to picture how the place might have looked like in the past. In some respect, it is sad to know that one will never be able to visit the Walled City as it was in the 1980s. On the other hand, its sanitary conditions were so critical that it would probably have been impossible for the Hong Kong government to simply keep it as it was, in order that future generations could go there and get a glimpse of how life had been in the 'city of darkness'. Street leading up to the entrance of the Walled City Park. The building opposite the park already existed before 1994, and I guess that some of the residents still remember the Walled City. How to get to Kowloon Walled City Park: go to Lok Fu MTR station (green line), then go to Junction Road and down towards the park. It's only about ten minutes on foot.